Settling a 70-year-old dispute between Bohr and Einstein and breaking through a supposedly "insurmountable" barrier to absolute zero are some of the numerous achievements of Alain Aspect, recipient of the 2005 CNRS Gold Medal. Alain Aspect, now 58, has made many breakthroughs in one of the most complex of scientific disciplines: quantum mechanics. “The concepts of quantum physics are outrageously counterintuitive,” warns Alain Aspect, from his office at the Orsay-based Institut d'Optique. 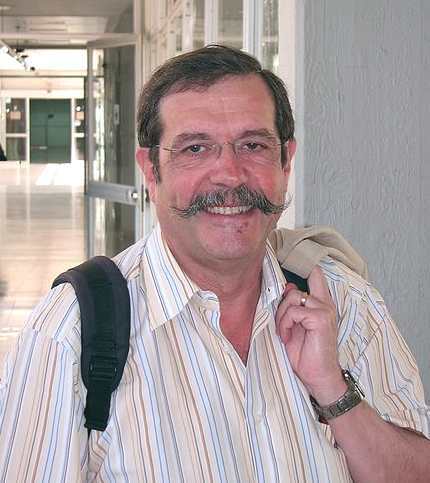 Senior researcher at CNRS and professor at the renowned Ecole Polytechnique, he is also a member of both the French Academy of Sciences and the Academy of Technologies. After graduating from the Ecole Normale Supйrieure (ENS) in Cachan and successfully defending a first thesis in holography at the Universitй d'Orsay, Aspect was introduced in 1974 to the subject of his main thesis (“doctorat d'йtat”) through a famous paper by John Bell.1 In 1982, he carried out his best-known experiments which confirmed that “quantum entanglement” for twinned photon pairs is irreconcilable with Einstein's world views (see box). He then succeeded, together with Philippe Grangier, in being first to produce single photons at identifiable moments—now called “heralded” single photons. They further revealed that a photon could travel as a wave through two places at the same time, even if it could only be observed in one location, as expected for a single particle. In 1985, together with Jean Dalibard and Christophe Salomon, Alain Aspect and Claude Cohen-Tannoudji launched a team to work on the laser cooling of atoms at Laboratoire Kastler Brossel (ENS). They pushed down atom cooling by breaking so-called “single photon limit,” getting down to one microkelvin—a mere millionth of a degree above absolute zero. Ready for new challenges, Aspect set up an atom optics group at the Institut d'Optique at Orsay in 1992. Inspired by the 1995 revolutionary creation of the first gaseous Bose-Einstein condensate in the US, his team launched a program on atom lasers, a device promising exciting applications. In 2001, the team became the first to obtain a condensate of atoms of metastable helium, and opened a new chapter in “quantum atom optics”. This multifaceted scientist is enthralled with his field: “The laser, the transistor and integrated circuits—and thus the computer—all have their origins in quantum physics, which also underlies the new field of quantum information.” So what's next for Aspect? “It's absurd to try to plan your life when you're a researcher,” he observes, “there is so much chance involved.” Indeed, where will the next quest lead this scientist, who is as hard to pin down as the particles of light he works with? 1. J.S. Bell, “On the Einstein Podolsky Rosen Paradox” (1964). Paper reproduced in Speakable and unspeakable in quantum mechanics, Cambridge: Cambridge University Press, 2nd edition, 2004. References: the main work of A. Aspect on superluminal propagation of the photons: Aspect A., Dalibard J., Roger G., Experimental Test of Bell's Inequalities Using Time-Varying Analysers. - Phys. Rev. Lett. 49, 25, (1982).